Kroger is a United States supermarket chain that was founded in 1893. The first location was opened in Cincinnati, Ohio and quickly grow into the largest grocery chain in the country. Customers are loyal to Kroger because of their customers reward programs, weekly specials, and coupons. Over the years Kroger has expanded the number of services that they offer to include pharmacies, florists, and money services. The money service center offers Kroger customers a way to purchase money orders, pay bills and cash checks. Kroger check cashing is one of the best ways for individuals with limited access to banks to get their payroll or other checks cashed. The Kroger check cashing service is conveniently located near customer service and provides shoppers with a safe and affordable way to quickly cash their checks. Below you will find important information about Kroger check cashing. Kroger check cashing is one of the most convenient ways to get access to money when you need it. Open on weekends and late, going to Kroger is an alternative to trying to fit visiting a bank into your busy schedule. In order to have a check cashed at Kroger no application or credit check is necessary. Stop by anytime with your social security or taxpayer identification number along with the check you need cashed. Kroger check cashing services accept payroll checks, corporate checks, tax refund checks, government checks, and insurance checks. At this time Kroger does not cash money orders or personal checks. The fee to cash a government or tax refund check at Kroger is currently $3.00. To cash a payroll, corporate, or insurance check at Kroger is $5.00. Any check cashed at Kroger can be loaded onto a Kroger 123 reward prepaid card for a fee of $3.00. Temporary card reload amounts cannot exceed $500.00 and personalized card reloads cannot exceed $1,000.00. 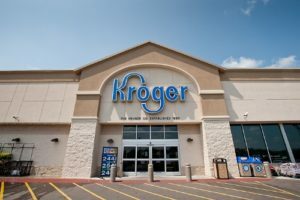 Most Kroger locations will not cash any government checks over $5,000.00, but during tax season some locations will accept refund checks of up to $7,500.00. Kroger money services reserves the right to refuse to cash payroll checks exceeding $950.00 and no location cashes personal checks. To find a Kroger check cashing location near you click HERE.